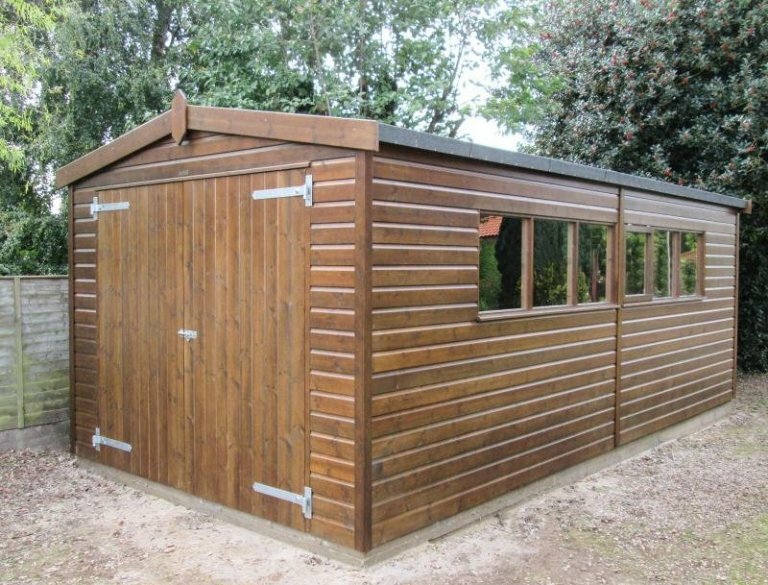 This Timber Garage is 3.0 x 6.0m, and it has been installed in our customer’s garden in King’s Lynn, Norfolk to use as a large workshop to tinker on their motorbikes in. The double doors on our garages (1900mm high x 2134mm wide) are larger than the double doors on our Superior Sheds (1800mm high x 1700mm wide), which is one of the reasons the customer chose to have a garage over a shed. The other reason for having a garage instead of a shed is that our garages don’t come with a floor (we install them directly onto the concrete base), and the customer wanted to work directly on concrete so that oil spills are more easily cleaned up, and not too much pressure is put on the floor. To avoid having to apply for Planning Permission, the customer chose to have the height of their garage restricted to 2.5m. Torched on, heavy duty felt has been used to protect the roof, the external cladding is shiplap, and the garage has been painted in a walnut stain, called Sikkens. There are seven colours in the Sikkens paint system, and all offer a natural, translucent coverage that allows the grain of wood to shine through. For more information on our range of Timber Garages, you can build your own by using our Online Garden Building Planner Tool, or you can call us on 01760 444229 to speak to our helpful team. Alternatively, you can also come and visit our Norfolk Show Centre, which is located between Swaffham and King’s Lynn on the A47, to view our range of garden buildings for yourself.